Size S: Shoulder -14in, Sleeves Length - 18in, Chest - 38in, Waist - 34in, Length - 45in. Size M: Shoulder -15in, Sleeves Length - 18in, Chest - 42in, Waist - 38in, Length - 45in. Size L: Shoulder -16in, Sleeves Length - 18in, Chest - 44in, Waist - 40in, Length - 46in. Size XL: Shoulder -16.5in, Sleeves Length - 18in, Chest - 46in, Waist - 42in, Length - 46in. 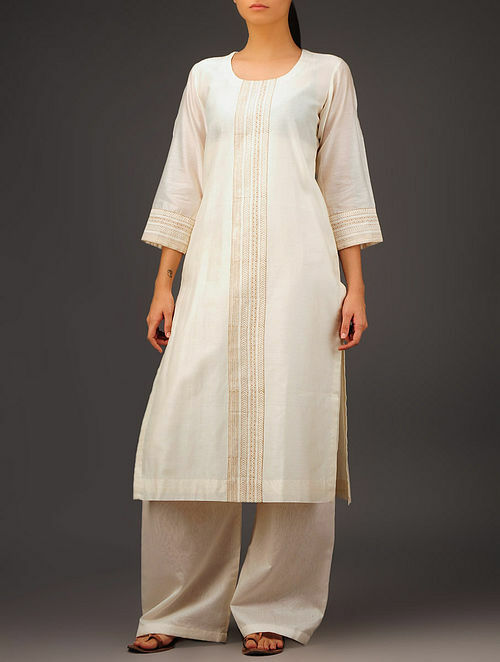 Hand-woven from chanderi,this kurta is light weight and perfect for daily wear. It comes with a cotton lining.It has beautiful geometric motifs which imparts an elegant look. These have been hand block-printed in Delhi and Sanganer, Rajasthan. Team it with a salwar or churidar in brighter hues to create a contrasting effect. Finish the look with kolhapuris and antique jewelry.